New simulations reveal how interactions between magnetic fields and particles sap a black hole’s energy. Black holes consume everything that falls within their reach, yet astronomers have spotted jets of particles fleeing from black holes at nearly the speed of light. New computer simulations have revealed what gives these particles such speed: cosmic robbery. The particle escapees steal some of the spinning black hole’s rotational energy, accomplishing this through two main mechanisms involving magnetic fields, the simulations’ creators report in the January 25 issue of Physical Review Letters. As a black hole spins, its dense mass distorts and twists the surrounding fabric of space and time. The simulations show that magnetic fields at the poles of the black hole become coiled and spring outward, flinging jets of particles into space. At the equator, magnetic fields collapse into clumps. This tangling creates areas that act like particle accelerators, boosting some particles into the edges of polar jets at high speeds and others into the maw of the black hole. The results are the most detailed look yet at the processes that power a black hole’s jets, according to study co-author Alexander Philippov, an associate research scientist at the Flatiron Institute’s Center for Computational Astrophysics in New York City. “No one has been able to push these simulations so hard in curved space-time,” says Philippov, who worked on the project alongside Kyle Parfrey of Lawrence Berkeley National Laboratory and Benoît Cerutti of the Université Grenoble Alpes in France. Upcoming data releases from observational missions such as the Event Horizon Telescope will put the simulations to the test, Philippov says. That telescope focuses on the supermassive black hole that inhabits the heart of the Milky Way galaxy and is designed to capture images of the regions where the jet forms. Tracking the formation of jets is tricky because of the complexity of the physics involved. Black holes bend space-time and generate powerful magnetic fields. Particles on the outskirts of the black hole zip around untethered from atoms in a state of matter called plasma. New particles can pop into existence, such as pairs of electrons and their antimatter doppelgangers known as positrons. 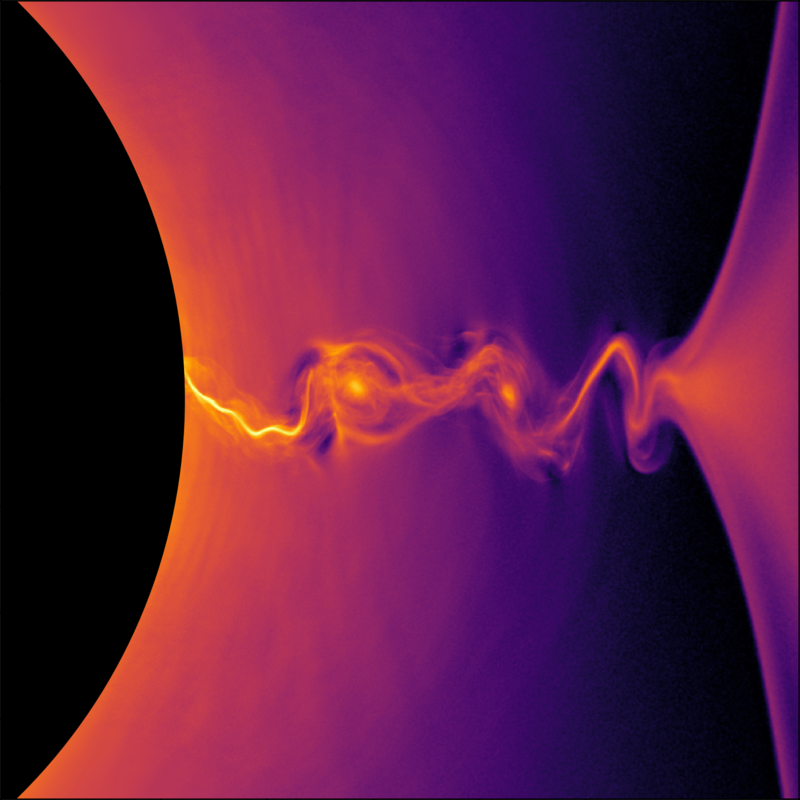 Previous attempts to understand the source of a black hole’s jets used a simplified model of plasma. Parfrey, Philippov and Cerutti instead employed new numerical techniques that provide the first representation of collisionless plasma around a black hole. In a collisionless plasma, individual particles don’t bump into each other often enough to be treated uniformly and represented simplistically. The new simulations begin with a spinning black hole surrounded by intense magnetic fields. Around the fringes of the black hole, the simulations create pairs of electrons and positrons. Because these particles have an electric charge, they are pulled along by electromagnetic fields. As the simulations progress, a previously predicted mechanism called the Blandford-Znajek process occurs near the north and south poles. During this process, the black hole twirls the fabric of space-time. This distortion twists the magnetic fields into coils near the poles. These coils then spring outward into space like a jack-in-the-box, extracting spin energy from the black hole and launching jets of particles. Near the black hole’s midsection, a different and unexpected particle-boosting mechanism appears. Magnetic field lines operating in opposing directions like a two-lane highway meet at the equator. This congregation causes the lines to twist and tangle. In the space between these bundles, the magnetic field is relatively weak compared with the black hole’s electric field. The electric field, now the strongest force at play, accelerates particles. Some fly outward, following a curved trajectory into the peripheries of the polar jets. Others speed into the black hole. From afar, the descending particles appear to have negative energy. As the black hole eats them, the black hole loses a bit of its rotational energy in what’s called the Penrose process. Overall, the simulations suggest that roughly 80 percent of the jet’s energy comes from the corkscrewing magnetic field at the poles, with the remaining 20 percent originating from the particles accelerated near the equator. The researchers hope to further hone their simulations by adding a more realistic portrayal of when and how electron-positron pairs appear around a black hole. They also plan to model the flow of material crossing the black hole’s event horizon.